An immediate hike in prices of petroleum products, including petrol and diesel, was not under consideration of the UPA government, union minister for petroleum and natural gas Murli Deora said here today. State-owned oil major BPCL has sought a hike in prices of petrol by Rs 4 and diesel by Rs 2 per litre in line with the rising crude oil prices in the international market. 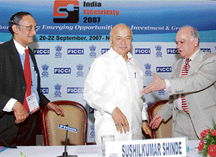 Union power minister Sushil Kumar Shinde today called for more players in power equipment manufacturing sector to meet the capacity addition of 78,000 MW needed in next five years to cater to the energy demands of the country. India Inc continued with its merger and acquisitions (M&A) frenzy in August striking an average of two deals per day, a marginal increase over the previous month's deal numbers, but over three-fold jump in value terms. Fair trade practices watchdog MRTPC has given a clean chit to Maruti Suzuki India (MSI) in a case filed by rival Hyundai Motor India Ltd (HMIL) over the publication of advertisements, which the latter claimed were “disparaging”. Formalities have been completed in setting up at least three thermal power plants so that Punjab can be a surplus power state in the coming five years. This was stated by Punjab Chief Minister Parkash Singh Badal at an interactive session organised by the PHD Chamber of Commerce and Industry yesterday. 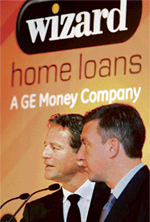 Home loan segment is set to witness competition with consumer financial services provider GE Money and international mortgage player Wizard today announcing a joint venture 'Wizard Home Loans' that will offer 9.99 per cent floating interest rate on home loans, as against the prevailing market rate of between 11 per cent and 12 per cent for varying tenures. The Foreign Investment Promotion Board (FIPB) today cleared proposals by car maker Maruti to form a joint venture for setting up an exhaust parts manufacturing facility in Haryana and by Citigroup Global Services to form a subsidiary to make investment in SEZ units. The fight between Britannia Industries and Danone over intellectual property rights of Tiger brand of biscuits has finally reached court with the Indian firm initiating legal action against the French food giant in Singapore. India today sought investments from Australian companies, particularly in the energy and infrastructure sector. State-owned National Hydro Power Corporation (NHPC) today said it expects to launch its initial public offer (IPO) in January-March quarter of this fiscal. Seeking to tap the inbound foreign tourists segment, BSNL has launched a special pre-paid card with instant activation facility at a cost of Rs 5,618. Minister of Commerce and Industry Kamal Nath has stressed on constructing more rail lines and improving their gauges for the development of industrial nodes being taken up under the Delhi-Mumbai Industrial Corridor (DMIC) Project. Puncom has won a contract of BSNL for supply of synchronous transport mode equipment (STM-16) worth Rs 36 crore, informed Puncom MD Anurag Verma. Heavy rains in Western India for the past few days have damaged onion crops in the region, according to reports from the main onion market of Lasalgaon in Nashik. $400m loan for hydel project. India set to be top sugar producer. Though the international crude prices were going up, the UPA government's approach was that the subsidy on petroleum products should continue as in the case of food and fertilisers, Deora told a press meet here. The proposal to float oil bonds totalling Rs 25,000 crore to offset the deficit of the public sector oil companies due to increase in crude prices was expected to come up before the union cabinet shortly, he said. "At present, we are not considering any increase. We are trying our best not to raise the prices of not only LPG and kerosene but also that of petrol and diesel," Deora said. The minister was here to inaugurate the refinery technology meet organised by Centre for High Technology and Mangalore Refineries and Petrochemicals Ltd.
Stressing the need to continue with the subsidy on the petroleum products, Deora said he had been in touch with finance minister P Chidambaram on the issue. Since the oil companies were losing heavily, the government was planning to float oil bonds to make up for part of the losses, Deora said. On chances of the Iran-Pakistan-India (IPI) natural gas pipeline project getting affected by the India-US nuclear pact, Deora said: "We cannot say that. I have no comment on that." Petroleum secretary M.S. Srinivasan, however, said official level talks on the project was still on. Asked about the purpose of the planned visit to Myanmar by a delegation led by Deora, he said India would be bidding for some of the exploration blocks in that country. Two blocks off the Kerala coast had been identified for exploration of natural gas. However, he said the places identified could not be disclosed at this state. These two blocks were in addition to three areas identified in Kerala-Konkan coast. In the normal course, off-shore exploration and development would take eight years, he said. Speaking to media persons after its 54th annual general meeting yesterday, BPCL chairman and managing director Ashok Sinha said: "We are hoping the price of petrol and diesel would be raised by Rs 4 and Rs 2, respectively." "The three oil companies are losing Rs 150 crore per day and BPCL's share is 25 per cent of that," Sinha pointed out. The other two companies are public sector Hindustan Petroleum and Indian Oil Corporation. Delivering the keynote address after inaugurating the “India Electricity-2007” he said lack of adequate domestic manufacturing capacity for generation equipment had been a major bottleneck in the way of timely completion of generation projects, therefore, creating more players in this field is the only way to increase capacities, bring in cost-competitiveness and accountability to timelines. Shinde said the capacity addition of 78,000 MW in the next five years was not too ambitious a target as various projects of a total capacity of 50,000 MW were already under implementation and the balance orders were expected to be placed by the year-end. Shinde said in a bid to enable private companies enter power purchase agreements with utilities and achieve financial closure, a special task force on hydro projects had been constituted in which the major states and some load-centre states were represented. A total of 62 M&A deals valued at $3.37 billion were announced in August, against 59 deals worth about $0.94 billion in July, according to data compiled by Grant Thornton. Although nearly equal number of domestic and cross-border deals were recorded last month, in value terms there was a distinct foreign flavour in the overall league table. The international consultancy and research major in its M&A report for the month said 30 domestic deals were announced with a total value of $0.66 billion, while the value of 32 cross-border deals was nearly four-times of this figure at $2.71 billion. The increase in the value was in sharp contrast to the general perception that the US sub-prime mortgage crisis and the subsequent impact on the global markets would slow down M&A activity. The most significant deals of the month were JSW Steel’s acquisition of three US firms Jindal United Steel Corp, Saw Pipes USA and Jindal Enterprises LLC and Wipro acquiring US-based Infocrossing Inc, Grant Thornton said. Another outstanding cross-border deal includes Holcim's increasing of its stake in Ambuja Cements to 36.20 per cent for $220 million. Out of total 32 cross-border deals, 21 were outbound with a value of $2.33 billion and 11 inbound deals with a value of $0.38 billion. Besides, the total number of private equity deals announced in August stood at 37 with an announced value of $1.22 billion dollar, against 30 M&As worth $2.79 billion dollar declared in July. The most significant PE deals were Fortress Capital, HSBC Principal Investments, Galleon Group, New Silk Route, GLG Partners, Quantum Fund (George Soros) and DA Capital investment of $337.50 million in infrastructure unit of Reliance Communication. Disposing of the one-year-old legal battle between the two auto giants, in which the Korean car maker accused MSI (formerly Maruti Udyog Ltd) of indulging in unfair trade practice by issuing “misleading” advertisements, an MRTPC Bench said there was no immediate cause for suspecting such a practice by the MSI. “We have prima facie come to the conclusion that there is no immediate cause of suspecting an unfair trade practice on behalf of the respondent (MSI) and it may not be necessary to proceed in the main petition,” the Bench comprising M M K Sardana and D C Gupta said. The commission observed that as per an undertaking, MSI had already stopped publication of objected advertisements in newspapers and hoardings. In September 2006, HMIL had filed a case against MSI’s advertisements, which used findings of a survey by TNS-TCS alleging it disparaged the company’s products. During the subsequent hearing in November, MSI submitted that it would not publish the disputed advertisement. Later, HMIL again filed an application alleging MSI that despite its assurance, the latter continued to use findings of the TNS-TCS study in advertisements and its dealers were circulating pamphlets and posters. To this, MSI had contended that posters and pamphlets were outside the purview of HMIL petition. Later, HMIL amended its original petition. The Chief Minister lamented that Punjab used to be at the top in every field earlier, but the progress has now started declining. He also informed that the state government was establishing skill centres in every block of the state as a part of its skill development plans. He also urged that a permanent committee of the government and industry needs to be created so that the manpower can be trained. He also informed the delegates that e-filing of returns would be made more effective. Sanjay Bhatia, president, PHDCCI, regretted that the agony of Punjab's economy was that it was continuously on the downslide and one important sector, agriculture, which was mainly responsible for state's economic growth, has recorded the slowest growth during the past five years. Bhatia suggested that cluster-based industrial development was necessary for the state's growth. He said there should be a thrust on growth of small-scale units and economic incentives, improved infrastructure, good governance and focus on growth of agriculture would help Punjab to be on the growth path. The joint venture will offer an aggressive interest rate of 9.99 per cent to consumers, T.P. Chopra, CEO, GE India, told reporters. Australia's Wizard Home Loans will invest $200 million in India by 2011, and aims to be one of the top five mortgage companies in the country in 5-10 years, said company chairman Mark Bouris. Wizard is a subsidiary of General Electric Co's retail finance arm GE Money. It expects to double its India business annually over the next three years. Wizard will initially offer its products through GE Money's Indian arm, and has applied to the regulator for its own operating licence. In addition, Wizard will provide loans against property to enable consumers meet needs such as business expansion or any other financial needs, he added. Maruti Suzuki India, till recently known as Maruti Udyog Ltd, plans to form a JV with Japan's Futaba Industrial Company to set up a facility in Manesar, Haryana. The proposal, which will see an FDI inflow of around Rs 45.90 crore with Futaba holding 51 per cent in the venture, was approved by FIPB today, official sources said. Besides, a proposal by Citigroup relating to setting up special economic zone units in the country was also cleared. The world's largest financial services group is looking to form a new subsidiary under its BPO arm which would make downstream investment for setting up SEZ units. “Based on legal advice and under the direction of its IPR committee, Britannia has initiated legal action against Groupe Danone in Singapore pertaining to Tiger IPR,” Britannia said in a statement. When contacted, a Danone spokesperson said it had a different position from Britannia regarding the IPR of Tiger. “We have tried to find a solution amicably. So a third party as a judge will be welcome to arbitrate,” the Danone spokesperson said. Meanwhile, Britannia said its chairman Nusli Wadia resigned yesterday from the IPR panel to ensure there was no conflict of interest in dealing with Tiger IPR matter and talks between Wadia Group and Danone over shareholder issues. The IPR committee will now be headed by Vijay Kelkar, an independent director. It will consist of Britannia MD Vinita Bali and two other independent directors Nimesh Kampani and Keki Dadiseth. “India’s growing and stable investment climate present immense opportunities for Australian companies, particularly in energy and infrastructure sector,” Pawan Kumar Bansal, minister of state for finance said while addressing the Australia-India business council investors’ meeting in Sydney. An official release quoting him here said India offered a huge market and enormous business potential with a growing middle class in the country. It had also the potential to become trade and business center of South Asia and East Asia with its proposed regional trade agreements with several countries and trade blocks in the near future. Bansal said that trade between the two countries has been continuously expanding. Bansal said that Indian investments in Australia are now well over $ 1 billion (US), mostly in IT sector. On the other hand, Australia ranks 10th and accounts for only about 2.37 per cent of total FDI approvals with $ 1.92 billion (US). To further widen and diversity the investor base, the limit of FII investment in corporate debt in India has been increased from $ 1.5 billion (US) to $ 2 billion (US) in April 2006. “We are waiting for the appointment of independent directors by the government and hope to come out with IPO in the last quarter of the current financial year,” NHPC chairman and MD S K Garg told reporters on the sidelines of a seminar - India Electricity 2007 - here. NHPC has a mandate to sell up to 24 per cent stake, but it proposed to offer 10 per cent to the public, and an additional 5 per cent disinvestment of government stake, he said. On the BSNL card, a user has to pay Rs 5,618 for an initial talk value of Rs 3,000 with a 30-day validity. The applicable pulse rate is 60 seconds and the charges are same as for India citizens, company officials said. In a communication to the railway minister today, Nath focused on the crucial need for the development of rail networks, especially in Madhya Pradesh, where the rail route kilometer length is much less than the neighbouring states, an official release said here. He also urged the railway minister to start work on Indore-Dhar-Chotta Udaipur route, expedite new line work from Indore to Dahod and linking Indore to Khandwa on a broad gauge route. This tender was for supply state-of-the-art technology equipment for transmission of voice and data on optical fibre cable using lasers. Traders said onion prices in the wholesale market have increased to Rs 1,785 per quintal from Rs 1,300. Further increases are not ruled out. The kharif crop from Maharashtra, Karnataka and Andhra Pradesh are likely to be hit by the rains. However, the late crop coming in by October-end is expected to be plentiful because of the rains, thereby bringing down prices.